Sapper 492110, Signal Coy, 46th Div, R.E. 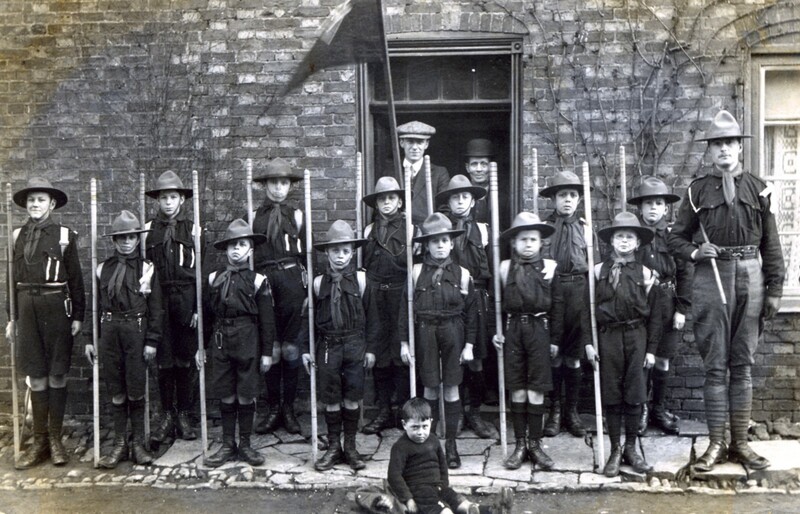 Bottesford Boy Scouts parade in Church St at the time of the Coronation of George V. Charles Calcraft is the Scout Master on the right of the picture. Six Bottesford men who enlisted with the army in 1914. Charles Calcraft is at the rear, in the centre. Charles Calcraft, seen as one of the Bottesford Ex-Servicemen's skittles team, by the club hut on Albert St, during the 1930s. Charles W Calcraft is remembered on the Methodist Roll of Honour in Bottesford. He was also recorded in the Bottesford Absentee Voters list, 1918/19, where his address was given as Wyggeston Terrace (a later name of Spalton’s Row) and his Service Number was given as 492110 46th Div., Signal Co., RE (Royal Engineers). Charles William Calcraft was born in 1888, in Nottingham (different sources give his place of birth as Netherfield or Basford). His father, George Calcraft, was born in Muston in 1857, and Elizabeth Calcraft, his mother, was born in Bottesford in 1855. In 1891, the Calcrafts were living in Bottesford, at 4 Spalton’s Row. This is the terrace located on the northern side of Grantham Road, comprising four small cottages and a larger adjoining cottage closest to the road. Its name changed to Wyggeston Terrace, which it has today. They now had three sons and one daughter: George Alfred, James Edward, Charles William and Sarah H. The two older boys were at school. In due course, all three boys would join the armed forces, and Sarah would serve as a V.A.D. nurse during the war. George joined the Royal Navy and tragically lost his life in an explosion on board the HMS Princess Irene, in 1915. James joined the Royal Marines until demobilized after the war. Charles was the last to enlist, joining the Leicestershire Regiment but serving for most of the war in the Royal Engineers. 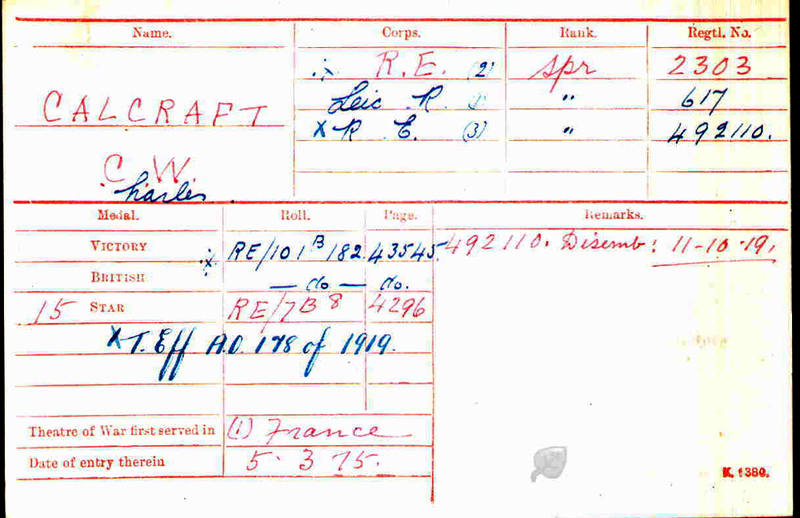 In 1901, the Calcrafts were still living at Spalton’s Row, other then George who had already enlisted. Charles William and Sarah were at school; James was working as a labourer at Singleton’s Farm on Chapel Street. Their father was working as a “labourer in limestone” (presumably a quarry worker). Charles went to Bottesford School and would soon move to Sedgebrook Grammar School, after receiving a receiving County Junior Scholarship in 1900, for which he was awarded a Silver Medal for being top of the scholarship entries. In 1911, Charles W. Calcraft still lived with his parents at 2 Wyggeston Terrace. He was 23 and worked as a postman at Bottesford Post Office. 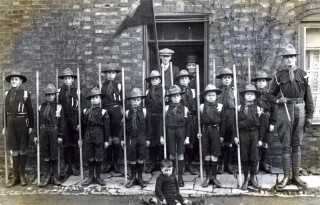 He was the founding Scoutmaster of the Bottesford Boy Scouts Troop during the years 1910/1911, and was one of three chosen from his unit to attend the coronation of George V. He was also a keen chorister, and continued to be an active member of the church choir after he returned from the war. Of his service records, we have only been able to locate his Medal Index Card and Medal Roll entry (National Archive), so only the sparest information about his service career can be given. He had been in the Territorials (5th Leicesters) before the outbreak of WW1, as a reservist. On re-enlisting, he was re-assigned to the 5th Battalion, Leicestershire Regiment, 617. He was transferred to the Royal Engineers (Territorials), Sapper 2303, then moved again to the Royal Engineers (Signals), becoming Sapper 492110, which number he retained to the end of his military service. He landed in France, on 15th March, 1915, with the 46th (North Midlands) Division RE in February, 1915. During March, 1915, the Grantham Journal reported that he had sent a cheerful message home, in which he said “we are within the sound of the booming of the big guns, and are really campaigning”. The fare including biscuits and bully beef, and their “lodgings” were a farmhouse, where they slept on straw. There is little further information about his activities during the war, except for the comments he provided to the Grantham Journal in 1944 (included below). He departed from Boulogne for demobilization of 11th October, 1919. By the end of WW1, he had been promoted to Acting Sergeant. He was awarded the 1914-1915 Star, the British War Medal and Victory Medal; also the Territorial Force efficiency medal. 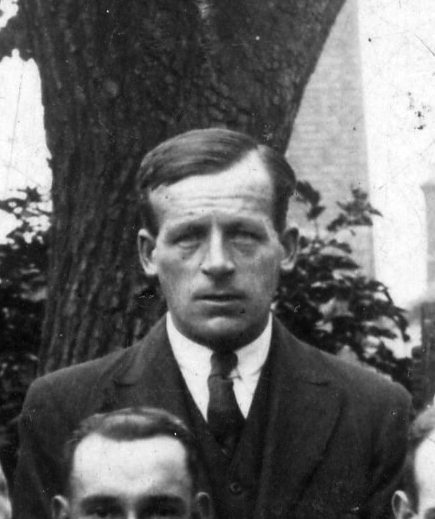 After being demobilized in 1919, he resumed his employment with the Post Office in Bottesford as a postman. He retired from the Postal Service in 1948, and was awarded the Imperial Service medal for completing nearly 44 years’ service. He remained an important member of the village community. He was the first secretary of the British Legion branch in Bottesford, and also secretary of the British Legion Council in Leicestershire and Rutland for 20 years until he retired from this post in 1952. He was the Clerk to Bottesford Parish Council. He became a Justice of the Peace in 1944, and a member of the War Pensions Committee. He was also a correspondent for the Grantham Journal for some years. He married Kate Ellen Sharpe in 1922. She was born in the Grantham area in 1895. Charles William and Kate Ellen Calcraft still lived at Wyggeston Terrace in the Electoral Roll of Autumn, 1926, as did his parents George and Elizabeth. Charles W Calcraft died in September 1963, aged 75, his death recorded at Melton Mowbray. He left a widow and two daughters, two sons having pre-deceased him. In March, 1944, the Grantham Journal reported the appointment of two Bottesford men, Charles William Calcraft and Fred Chandler, as County Magistrates. This article included a summary of Charles Calcraft’s career; a transcript of the relevant parts is presented here. Two Bottesford residents have this week been honoured by being appointed Justices of the Peace for the circuit of Leicester, named Mr Charles William Calcraft, a postal employee aged 56, and Mr Fred Chandler, farmer, Manor Farm, Easthorpe. In the case of Mr Calcraft, the honour is a fitting reward for conspicuous service which he has so unstintingly rendered over a period of many years notably in connection with the British Legion and ex-Service-Men. The appointment recalls a remarkable record of service by members of his family to the Armed Forces many having served with the Army and Navy. “Members of the Calcraft family have resided in the Vale of Belvoir for at least 400 years” explained Mr Calcraft in an interview on Tuesday. “The name, in fact, is one of the oldest on the tenant roll at Belvoir. It occurs first in the marriages n Bottesford parish registry on May 25th 1563, and it is also recorded in Redmile parish registry. Members of the family apparently migrated to Muston for the name appears in Muston parish registry in January, 1677.” Thus the family can justly regard itself as one of the oldest in Leicestershire. Mr Calcraft, a postal employee, was born in Nottinghamshire, but has resided in Bottesford practically all his life, apart from war service. He married at Redmile to Miss K.E. Sharpe of that parish. Mrs Calcraft was then on the nursing staff of Derbyshire Royal Infirmary, where she completed her training, and she is a State registered nurse. They have three daughters and a son. Mr Calcraft was educated at Bottesford School and Sedgebrook Grammar School. In 1900, he headed the Leicestershire junior scholarship list and was awarded a silver medal to mark the achievement. He later sat for the Civil Service, again heading the list for Nottinghamshire P.O. He then secured an appointment as sorting clerk and telegraphist but on medical advice left indoor work for outdoor duty. In 1908, he joined the Territorial Force, was mobilised in 1914 with his battalion, the 5th Leicestershires, was transferred to the R.E. Signals, and went overseas with the 46th (North Midlands) Division in February, 1915. He remained with them throughout the war and in the April following the Armistice proceeded to Germany for service with the Army of Occupation. Whilst in the army, he passed for the Secret Service (competent French), but remained with his own unit at the request of the Commanding Officer. He undertook billeting work in connection with his Company, and also did useful service in settling minor disputes etc. with the French civilians. On returning home in September 1919, he resumed his former occupation in the postal service. He joined the Comrades of the Great War organisation, remaining with them until the formation of the British Legion in 1921, with which he has been actively associated ever since in a variety of capacities. He is one of the oldest members of the Midlands Area Council, and has been hon. secretary for the Leicestershire and Rutland British Legion Council since its inception. Mr Calcraft has been the recipient of the highest honour within the power of the Legion to bestow, viz. a certificate of appreciation “in recognition of valuable service rendered to ex-servicemen and their dependents in the Bottesford branch, Leicestershire and Rutland British Legion Council and on the East Midland Area Council since 1921″. It is of interest to recall that the Leicesershire and Rutland British Legion Council were awarded the Cuming Cup for county efficiency in 1937-8. He was one of three appointed to represent Melton Company Territorials at the Coronation of King George Vth; he also attended his funeral as a representative of the Legion, and that of Earl Haig in Westminster Abbey. In connection with the British Legion pilgrimage to France and Flanders in 1928, he acted as chief accommodation officer for the Valenciennes district. He is proud possessor of four medals – the 1914-15 star, general service allied victory and Territorial Force efficiency medals. During the present war, he served for over two years with the Royal Observer Corps. He is a member of the Grantham, Boston and District local war pensions committee, and is local representative of the Ministry of Information. 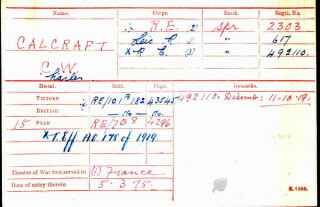 His brother Able-Seaman George Alfred Calcraft was killed on H.M.S. Princess Irene in 1915, after serving in the Navy for 15 years. Another brother, James, is a pensioner of the Royal Marines and now lives at Nottingham. His sister, Mrs Anderson, served with the V.A.D. during the Great War, and subsequently was married in New Zealand, and her son is with the Allied Forces in Italy. 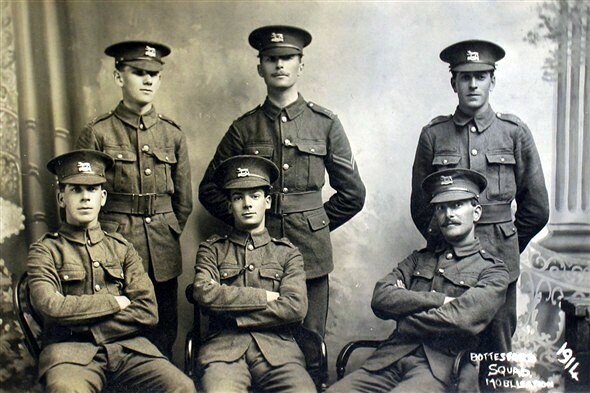 In the military photograph he has the Leicestershire Regiment cap badge, indicating that this was taken before he transferred to the Royal Engineers and landed in France on the 15th March, 1915.